After a smash hit success with Seabiscuit, her book about a horse, Laura Hillenbrand has taken on another runner as the focal point of her new book. This time the runner who will lead readers on a merry chase has two legs instead of four. He is former juvenile delinquent, former Olympic runner, and then, World War II prison camp survivor, Louie Zamperini. Zamperini is Hillenbrand’s focal point, but the scope of her exciting book goes far beyond the life and exploits of one man. Her deeper theme is the human aptitude for survival. The author’s amazing ability for research has rounded up an array of details that constantly grabs our attention. We not only follow Louie from his rebellious childhood to his current status as an active nonagenarian, we also meet his family, his friends, comrades in arms, captors, and fellow prisoners. Hillenbrand’s descriptions make each scene vivid and vibrant. The author admires Zamperini as a brave man and a survivor, but she makes it clear from the first chapter that this is not a comfortable tale of hero worship or unabashed adulation. The book begins by revealing the young Louie Zamperini as a lying, thieving, brawling cheat. It’s as if Hillenbrand is challenging us to try and care what happens to the adolescent sociopath. As her tale unfolds, she makes us care. She shows us how the thick skin developed in Zamperini’s formative years strengthens into the armor he needs to endure horrendous conditions. Louie Zamperini was born in New York, but grew up in Torrance, California. He arrived in his new surroundings as a first generation American who spoke only limited English. His quick fists became his first line of defense against the cruel torments of his schoolmates. His misconduct, starting with vandalism and petty theft, and later advancing to full-fledged burglary, became a way of seeking attention when no positive notice was forthcoming. It was while escaping both the police and the victims of his escapades that Louie developed his ability as a runner. The “Tornado” broke records in a number of distance events and ran his way on to the United States Olympic team for the 1936 Berlin games. Zamperini might have won a medal, but his poverty-stricken background defeated him. On the ship heading for Europe, Louie, who had known the deprivation and hunger that millions of people experienced in the great depression, was tempted by the seemingly endless supply of food available to the athletes. He gained 12 pounds on the voyage and came in 8th in his major race. His finishing sprint was still impressive enough to attract the attention of Nazi leader Adolph Hitler. The genocidal dictator asked to meet the runner and Zamperini obligingly shook Hitler’s hand. Hillenbrand’s solid portrait of Zamperini comes to life all over again when war breaks out. In some ways, the war in the Pacific theater of operations becomes the main character in the second part of the book. Zamperini continues to serve as the lens through which we witness the action, but the action itself takes center stage. The Olympian from Torrance joins the military, is trained as a bombardier and assigned to the crew of a B-24 bomber, arguably the most graceless plane in the U.S. WWII arsenal. Our anti-heroic hero is never far from the pranks and misbehaviors of his youth, but now he is in uniform as an essential part of a flying team. The toughness that set Louie apart in his early years served him well in the battles he faced against Japanese aerial attacks, both in the air and on the ground. It was not a battle mission, but rather a somewhat futile search and rescue mission that caused the crash that kicks off the core of Hillenbrand’s book. Zamperini’s aircraft crashes into the Pacific while hunting for a possibly downed plane from his squadron. Three men out of seven survive the crash and, thanks mainly to Louie’s efforts, manage to get into two life rafts. What follows is an ordeal that includes attacks by sharks, strafing by enemy aircraft, extreme thirst, near starvation, battles against depression and hopelessness, and the death of one of the surviving three. The author weaves small details, some gathered from survivors’ accounts and some, of necessity, imagined, into a colorful and gripping tale. The reader feels the tossing of the ocean, the constant danger, and the beating of the unforgiving sun as the men drifted for a total of 47 days. The odds between rescue and death fluctuate constantly. When fate, wind, and currents finally bring the remaining airmen to land, they fall into the hands of enemy combatants. The next two years are a waking nightmare of beatings, interrogations, torture and humiliations. Few if any of their captors are humane. One, nicknamed The Bird, is sexually gratified by beatings and cruelty. The threat of execution, for imagined infractions, or simply for being American prisoners, is a daily shadow over their lives. Illnesses, including some deliberately caused as medical experiments by their keepers, wrack the prisoners. Yet, as Hillenbrand emphasizes repeatedly, the will to live still thrives. Ironically, that will weakens in Louie Zamperini only after his liberation. He returns to civilian life and takes refuge in alcohol. Revenge on his former guard, The Bird, becomes a festering obsession. The emotional and physical pain he held at bay through the horrors of war, survival at sea, and life in various Japanese prison camps—each worse than the one before—now engulfs him. The Hollywood-like salvation that pulls Zamperini back from the brink of alcohol-enhanced madness and destruction is a dramatic conversion to religiosity by none other than the then young Reverend Billy Graham. The author allows the fairytale ending to sweep her along and this becomes the weakest section in an otherwise enthralling book. However, she has painted her protagonist’s portrait so firmly that even a skeptical reader will hear the distant organ music and rejoice at Louie Zamperini’s redemption. 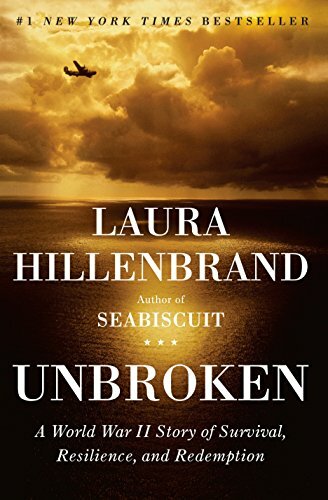 Hillenbrand titled her work Unbroken. Louie is not completely unbroken. What we see is a man who has fallen many times, but gets up and perseveres each time.